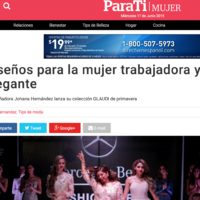 GLAUDI by Johana Hernandez collection is featured on Nuestra Belleza Latina designing for all the participants of all shapes and sizes. GLAUDI by Johana Hernandez is the official designer for Luceros new music video “NO PUDISTE AMAR ASI” exclusive news by DESPIERTA AMERICA UNIVISION. GLAUDI and Blink Fitness on Acceso Total! Katie Angel dressed in GLAUDI for Premios Juventud! GLAUDI and Blink Fitness featured on PR Week! HOLA.com and their amazing review on GLAUDI!